We’re sorry! At the moment you can’t order from our webshop outside of Sweden. Please find your local retailer here. If you’re outside of Europe, please contact our US office (us.hilleberg.com/). 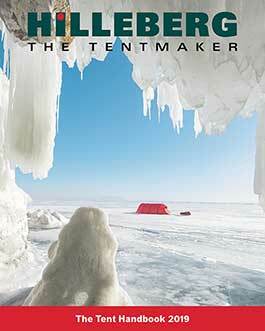 If you’ve got any questions, please send us an email at tentmaker@hilleberg.se or give us a call +46(0)63571550. Thank you for choosing Hilleberg! This site www.hilleberg.com (‘the Site’) is provided by Hilleberg the Tentmaker AB, org. no. 556538-1885, Önevägen 34, 832 51 Frösön (‘Hilleberg’). By the terms ‘we, our and us’ we refer to Hilleberg. In order to register a user account with us, or in order to purchase products from our site, you must be at least 18 years old. If you are under 18 years old, you must have the consent of a parent or guardian. By purchasing products from our range, subscribing to our newsletter or registering for a user account with us, you accept our applicable general terms and conditions and confirm that data you provide about yourself is accurate. We are entitled to unilaterally amend these general terms and conditions for the Site (‘General Terms and Conditions’) and any changes we make will enter into force no sooner than 30 days after the amended terms and conditions are published on the Site. Hilleberg the Tentmaker AB (organisation number 556538-1885) adheres to the provisions in the Act on Distance Contracts and Agreements Outside of Business Premises (SFS 2005:59), the Consumer Purchase Act (SFS 1990:932) and the Personal Data Act (SFS 1998:204) for all purchases made through www.hilleberg.com. All prices on www.hilleberg.com are inclusive of VAT. If the parcel is not collected, a return fee of SEK 200 will be debited for the cost of returning the parcel to Hilleberg the Tentmaker AB. You can contact us either by phone on +46 (0)63 571550 during weekday office hours or by email at tentmaker@hilleberg.se. Please include your name and order number if your inquiry is concerning an order. Please also include your phone number if you would like us to call you back. Customer services are open 08:00-17:00 on weekdays (not including public holidays). Once you have ordered through the Site, you will receive an email containing your order confirmation. If you have not received an email, please check your junk folder. If you cannot find the email, this may be because you have provided the wrong email address. In this case, please contact us at the contact details set out above in section 2. Our prices applicable at any given time are set out in our price details on the Site. We reserve the right to amend prices for our products in relation to circumstances beyond our control, such as changes to the prices of raw materials, exchange rates, taxes, fees and so on. All prices include VAT of 25 per cent. If the rate of VAT changes, we reserve the right to adjust our prices and fees by the equivalent amount. We reserve the right to correct any written or printing errors. Our online store only accepts orders to shipping addresses in Sweden. Standard delivery is within 1-3 working days if the item is in stock. If the item is not in stock or if delivery is anticipated to take longer than normal, this will be specified in the order confirmation you received in accordance with section 3 above, and in some cases we may contact you separately. If you have provided an email address when ordering, you will receive an email when the item has left our warehouse and you will be able to track the shipment in real-time. You will then receive information from the carrier by phone, text message, email or letter. Business deliveries that are dispatched directly are not notified prior to delivery. The cost of shipping will be indicated during checkout. Shipping is free for orders of more than SEK 300. Incoterm (international commerce terms) DAP (Delivered At Place) apply to all shipping methods listed below unless otherwise agreed. See more about our different shipping methods below. Our collaborative partner Schenker is engaged by us for domestic deliveries to private individuals and companies, as well as business deliveries abroad. The services we use at Schenker are Schenker Parcel, Schenker System, Schenker Direct. For further details about this carrier and its mode of delivery, please visit Schenker. Our collaborative partner Postnord is engaged by us for domestic deliveries to private individuals and companies, as well as business deliveries abroad. For further details about this carrier and its mode of delivery, please visit PostNord. Urgent parcels may be sent using expedited shipping by agreement. This option is not available to select at checkout online. For further details about this carrier and its mode of delivery, please visit DHL. All parcels are booked and administered via the Unifaun transport administration system. In certain cases we call or email the carrier directly. If possible, we offer notification services via Unifaun and our carriers by text message, phone and email. For further details about this, please visit Unifaun. You pay during checkout on the Site using your card. We accept Visa, MasterCard and Maestro. In the case of returns, refunds will be paid to the bank account you provide when making your return. We carry out the card transaction in partnership with DIBS Payment Services and Svenska Handelsbanken. Once you have placed your order and completed payment, we will debit the sum from your card. DIBS Payment Services is PCI-DSS-certified by the card industry (including VISA and MasterCard), enabling it to process payment transactions at the highest level of security. When you pay by card, you are sent to a secure page with an SSL certificate where you securely enter your card details and complete payment. Hilleberg.com never processes your card details. PCI-DSS stands for Payment Card Industry Data Security Standard, and is a comprehensive scheme that aims to increase data security in all parties who store, process or transfer card data, in accordance with the stricter requirements of the card companies. By law, customers have 14 days to return an item from the date of receipt. If, for any reason, you are not satisfied, the item should be returned in the same condition as it was received. We fully understand that you cannot return the tent folded in the same way it arrived and completed dust-free. In the event of returns, we would prefer that the item has not been used outdoors. In the event of returns, the customer covers the cost of return shipping, i.e they pay for the cost of shipping the item back to us. If you wish to return your item, please email us at tentmaker@hilleberg.se and provide your order number and details of what you wish to return. We ask that you pack the item properly, in its original packaging if possible as well as in protective shipping packaging equivalent to what it was shipped in when you received it. Please return the item to us within 14 days of notifying us that you wish to return your purchase. We will refund the entire sum you paid, including any shipping costs you paid for the delivery of the item to you. If your treatment of the item has resulted in depreciation of the item’s value, we will make a deduction corresponding to this fall in value from the refund sum. We will repay the money without undue delay and no later than 14 days after receiving your notification that you wish to exercise your right of return and the item has been returned to us. There is also a standard form available to exercise your right of return on the Swedish Consumer Agency’s website (www.konsumentverket.se) that you can use. Despite careful quality controls of our suppliers and products, defects may be found in products in rare cases. The Consumer Purchases Act entitles you to complain within three years of receiving the item, provided that the item was faulty upon delivery. When you receive your item, we therefore recommend that you always check the item and note any defects (damage to item, damage to packaging, missing packaging) on the shipping documentation/scanner, which is then signed by you and the driver. The same approach is recommended when collecting parcels/goods from parcel collection points/goods terminals. If you receive an item that is faulty in some way, please contact customer services as soon as possible via the above details, see section 2. Please provide your order number and a description of your issue, and submit pictures of the defective item in which the defect is clearly visible to ensure quicker processing. Please note that you must notify us with details of the fault ‘within a reasonable time’ after discovery. If you complain within two months of discovering the fault, you will be considered to have notified us of the error within a reasonable time. We will normally contact you within a few days of receiving your notification. If, after contacting us, you wish to return the item, send it to the address on the returns label that was sent to you. You can obtain a returns label by email to print at home or by letter. The returns label should be attached to the box which you drop off at your parcel collection point. Naturally, we will cover the cost of return shipping and the cost of shipping new items or spare parts to you in the case of complaints. In the event of complaints, you are responsible for risks associated with shipping. This means that you are responsible for ensuring that the shipment is not subject to further damage during shipping to the supplier - so pack the item well. Always save the shipping note/returns label until you have received confirmation that the item has reached us. Once we have received the item you wish to complain about, we will assess whether there is anything wrong with the item. In the case of an approved complaint, we will cover the cost of shipping and other expenses relating to the item you have complained about. If we believe there is not an inherent fault with the item, we may debit you for the cost of examination and any other costs that the complaint has caused us and/or any relevant suppliers. The refund method will be determined by how you chose to pay for your item. See section 6 above. Any instances of fraud or attempted fraud will be reported to the police. We reserve the right to refuse or cancel your purchase if we have grounds to suspect fraud, hacking and/or any other kind of misuse of the Site. We are not liable for any consequences of the failure to fulfil certain obligations under these General Terms and Conditions, if such failure is due to circumstances described below and the circumstances prevent, obstruct or delay fulfilment. Mitigating circumstances include measures or failures from the authorities, new or amended legislation, conflict in the labour market, blockades, fire, flood, sabotage or major accidents. Force majeure encompasses decisions by the authorities that have a negative impact on the market and products, such as decisions concerning warning texts, bans on sales, etc. as well as unusual falls in the market. Please contact customer services via the above details, see section 2, if you are not satisfied with anything you have ordered from us. If you remain dissatisfied, you may contact the National Board for Consumer Complaints, www.arn.se or Box 174, 101 23 Stockholm. We make no commitment to participate in alternative dispute resolution processes, but will make a final decision on this matter in the event of a dispute arising. You may also use the online platform for complaints provided on the European Commission’s website: ec.europa.eu/odr. Swedish material law applies to these General Terms and Conditions. For details of which rights you have a consumer, we recommend you visit the Swedish Consumer Agency's website www.konsumentverket.se. Our goal is that the Site should always work satisfactorily for you the user, but it is provided on an as is basis at the current quality. We will always do our best to ensure that our services work in the best way possible for you. Hilleberg the Tentmaker AB, org. no. 556538-1885, Box 25, Se-832 21 Frösön (‘Hilleberg’) processes personal data in accordance with applicable legislation, including the EU’s General Data Protection Regulation. By the terms ‘we, our and us’ we refer to Hilleberg. We process personal data in a lawful, correct and open manner. We collect personal data for legitimate purposes that are set out in this policy, and do not process personal data that is in any way incompatible with these purposes. The personal data we process is adequate, relevant and necessary for the purposes they are collected and used for. The personal data we process is correct and, if necessary, updated. 1.1 Who is processing your personal data? Hilleberg is responsible for the processing of personal data you provide to us or that we collect about you. 1.2 What personal data do we process? We process both data that you provide to us and that we collect from you. Address details Hilleberg the Tentmaker AB retains address data for private individuals in order to deliver deliveries ordered by private individuals. Hilleberg the Tentmaker AB engages shipping providers and their logistics partners to deliver ordered goods, provide tracking services and billing services to private individuals. The personal data processed encompasses names, addresses, emails and phone numbers. Billing address details Hilleberg the Tentmaker AB retains billing address details for private individuals in order to bill and receipt sales and account for orders made by private individuals. These billing address details will be retained for 7 years in accordance with the Accounting Act. Data may be deleted after 7 years if a private individual requests this. Contact details In connection with order registration, Hilleberg the Tentmaker AB opts to record contact details such as email addresses and phone numbers. These details are provided in order to contact the customer in relation to their order and to provide delivery notification. Order reference In connection with order registration, Hilleberg the Tentmaker AB opts to record an order reference in order to enable orders for larger companies or organisations to be easily tracked. Serial number Organisation number, customer number, order number and invoice number are all used to help us in maintaining our accounts and to maintain our database. Due to accounting reasons, these details will be retained for 7 years in accordance with the Accounting Act. Data may be deleted after 7 years if a private individual requests this. When you use the service, we collect personal data about you. This may include your IP address, operating system and other similar information that ensures the smooth operation of our website. 1.3 Why do we process personal data and what legal basis do we have for this processing? In order to administer deliveries that you order from Hilleberg, Hilleberg will process the personal data set out above in section 1.2. The legal basis for Hilleberg’s processing of your personal data is that it is necessary in order to fulfil the agreement with you or to implement measures prior to the entry into force of such an agreement. Hilleberg will also process the personal data specified above in order to manage any claims you make seeking to exercise your right to complain about our services. The legal basis for Hilleberg’s processing of your personal data in this regard is that it is necessary in order to fulfil an agreement and to fulfil Hilleberg’s legal obligations. If you do not provide the personal data specified above, we will be unable to deliver all our services and fulfil our obligations to you. Hilleberg may process the personal data specified above for statistical purposes, and in order to improve and develop our services. The legal basis for this processing of personal data is that the processing is necessary for purposes related to Hilleberg’s legitimate business interests. One such legitimate interest is to improve and develop our services, which is beneficial for you as a stakeholder in such services. Hilleberg may process personal data specified above in order to send offers and newsletters to you via electronic communications channels such as email. The legal basis for this processing of personal data is that the processing is necessary for purposes related to Hilleberg’s legitimate business interests. One such legitimate interest is to send marketing to you on the basis of the potential benefits this may offer to you as a customer. Our interest in processing your personal data for marketing purposes therefore takes priority over your potential interest in protecting your personal privacy. 1.4 Who do we pass on personal data to and where are data processed geographically? Your personal data may be passed on to and processed by third parties. We disclose your personal data to our collaborative partners and to our service providers who process personal data on our behalf, also known as personal data processors. We have agreements with our personal data processors that ensures that they process your personal data in accordance with applicable privacy legislation, this policy and our instructions. Hilleberg may also share your personal data in order to facilitate mergers, acquisitions or sales of all or parts of Hilleberg's assets. We disclose personal data to the following companies: Zedcom, Deloit, Privins, Ecster (handelsbanken finans), Svea inkasso, Kornboden, Postnord, Postnord lager, Zufall, Zedcom, Monitor, Hilleberg Inc, Hilleberg Esti OU, NETS, DIBS, Unifaun, Schenker, DHL, Jarbeaux Sport, Foxycart. 1.5 For how long do we process personal data? We only process personal data for as long as there is a need to retain them to fulfil the purpose that the data was submitted or collected for. The same personal data may be stored in several places for different purposes. This may mean that data that has been removed from one system because it is no longer necessary for that purpose may remain in a different system where it is stored with a different legal basis, or for a different purpose for which the personal data is still required. Personal data processed by Hilleberg in order to administer your customer relationship or to fulfil our agreement with you, e.g. by fulfilling advertising undertakings, will be processed during the period that it is necessary for Hilleberg to be able to administer the customer relationship and fulfil our obligations to you. We may retain your personal data for up to a year after your customer relationship with us has ended for the marketing purposes set out above. We consider you to be a customer during the period that our agreement concerning delivery is active or any other contractual basis exists in our relationship. Your personal data may be retained for a longer period that specified above if this is necessary for compliance with legal requirements or as a result of a decision by the authorities. When we process your personal data, you have certain rights by law. Please note that exercising these rights is subject to certain requirements and terms and conditions that are specified by law (the EU General Data Protection Regulation). You have the right, without charge, to request in writing information about which personal data we process about you and how we process them. You also have the right to receive a copy of any of your personal data that we hold. Our contact details are set out above, see section 1.1. If you have no grounds for making a request or your request is unreasonable, e.g. if you request an extract covering a brief time period, we must either decline your request or charge a fee that covers the administrative expenses we incur as a result of your request. If your personal data are incorrect or incomplete, you have the right to request that we correct or supplement such data. You have the right to request the deletion of your personal data in certain circumstances (which are specified in the EU’s General Data Protection Regulation). If your request falls within these circumstances, we will delete your personal data. You may object at any time to the processing of your personal data for direct marketing purposes, including profiling for such purposes. If you would prefer us not to process your personal data for this purpose, please notify us by contacting us. Our contact details are set out above, see section 1.1. In certain circumstances, which are further specified in the EU’s General Data Protection Regulation, you have the right to request that processing is limited. If you have this right, such personal data, excluding storage, will only be processed with your consent, or in order to establish, enforce or defend legal claims or in order to protect the rights of another natural or legal person or for reasons of substantial public interest. In certain circumstances, which are further specified in the EU’s General Data Protection Regulation, you have the right to obtain any of your personal data that we hold that you have provided us in a structured, widely used and machine-readable format. Provided that it is technically possible, you have the right to have these data directly transferred to another personal data controller. Hilleberg reserves the right to amend and update the policy. In the event of amendments to the policy or if existing information is to be processed in a different way than is stated in the policy, Hilleberg will provide notification of this in an appropriate manner.